Does foreign language learning seem awfully slow? 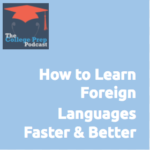 Tune in as Megan and Gretchen reflect about 10+ ways to learn languages, including English, faster and more effectively. Today’s episode is a response to a listener named Hassan, who lives in Iran and is studying electrical engineering. He wants to know how to learn English faster. This advice will be for students who want to go “above and beyond” the language learning they’re already doing in their classrooms. Sign up for a “word a day” SAT service, and practice incorporating that word in your daily life. Speak with native speakers as much as possible. Finds ways to “immerse” yourself. Listen to TV, radio, and podcasts. Talk about them with friends in the language you’re listening to them in. Click here to head over to the College Prep Podcast to listen to this episode. Can “Truth or Dare” Really Be a Study Technique?! Do You Lose Papers in the ADHD Wormhole?